Is your local playground safe? Although the weather may be colder this time of the year, we know that doesn’t always slow kids down from bundling up in their winter gear and playing outdoors. Playgrounds are everywhere from your backyard to the neighborhood park. It’s important to know what safety features to look for before your child hangs out at the local park. Our staff at Drs. Morrow, Lai & Edwards found some important safety tips on the American Academy of Pediatrics’ website that we’d thought we’d share with you today. 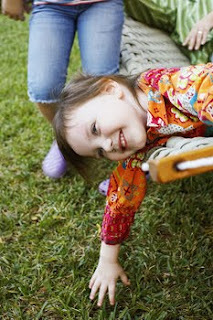 They include what to look for on a public playground and tips on ensuring your home swing set is functioning properly. * Carefully supervise young children using playground equipment. Keep children from shoving, pushing, or fighting. * The surface under playground equipment should be energy absorbent. Use safety – tested mats or loose fill materials (shredded rubber, sand, wood chips, or bark) maintained to a depth of at least 9 inches. * Install the protective surface at least 6 feet (more for swings and slides) in all directions from the equipment. * Swing seats should be made of something soft, not wood or metal. * Children should not twist swings, swing empty seats, or walk in front of moving swings. * Put home playground equipment together correctly. It should sit on a level surface and be anchored firmly to the ground. * Cap all screws and bolts. Check periodically for loose nuts and bolts and broken, rusty, or sharp parts. * Install playground equipment at least 6 feet from fences or walls. * Check for hot metal surfaces on equipment (in warm months) such as those on slides, which could cause burns. * Never attach ropes, jump ropes, clotheslines, or pet leashes to playground equipment because children can strangle on them. We hope these tips help! Here’s to safe and happy holidays, from our entire team at Drs. Morrow, Lai & Edwards!